By Keith Cowing on June 26, 2008 12:01 PM. Editor's note: According to NASA sources, Spacehab notified NASA on 29 May 2008 that it was requesting that its COTS (Commercial Orbital Transportation Services) Space Act Agreement (SAA) be terminated within 30 days. The reason given by Spacehab is an inability, on Spacehab's part, to meet SAA-specified milestones with the use of internal funds. NASA will terminate the SAA on 28 June 2008. Spacehab has confirmed this information but says that no formal press release is expected at this time. Today's Video: Prizes? We Don't Need No Steenking Prizes! By Keith Cowing on June 25, 2008 5:46 PM. Editor's note: This interesting video "Bounty Hunters! ", by Politico.com, talks about John McCain's proposal for a $300 million prize for an advanced electric car battery, Barak Obama's suggestion that President Kennedy did not need to offer a prize to get America to the Moon (that the government was better), the X Prize, and Darth Vader's pursuit of the Millenium Falcon. Continue reading Today's Video: Prizes? We Don't Need No Steenking Prizes!. By Keith Cowing on June 24, 2008 10:24 AM. 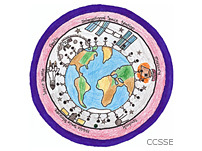 "This spring Challenger Center for Space Science Education invited students to use their creativity to design an original piece of art for a student mission patch for private space explorer, Richard Garriott. As the next civilian to fly to space, Richard plans to engage students around the world with his flight to the International Space Station planned for October 2008. The design was intended to symbolize the adventure and discovery of spaceflight. The winning design by Sarah Nakata, a student from the Brownsburg Challenger Center in Indiana, will appear on a special t-shirt that Richard will fly into space." By Keith Cowing on June 24, 2008 9:44 AM. "The military informed SpaceX last week that mandatory support equipment and tracking stations in the Pacific Ocean are booked through the end of July, forcing officials to delay launch of the next Falcon 1 rocket, the company's founder said Friday. Elon Musk, the billionaire founder of Space Exploration Technologies Corp., said the U.S. Army range at Kwajalein Atoll will be busy with other activities for the next month. "Launch is no sooner than late July to early August," Musk said. "We will use the time to do additional checkouts." By Keith Cowing on June 19, 2008 10:03 AM. "Gov. Bill Richardson's unsuccessful presidential campaign was the largest contributor to a political action committee that pushed for passage of a spaceport tax referendum in Sierra County last April, according to reports submitted to the New Mexico Secretary of State's office. The Richardson for President campaign gave $10,000 to People for Aerospace of Sierra County on April 8, two weeks before the April 22 vote in which Sierra residents overwhelmingly approved the tax, clearing the way for a spaceport taxation district." By Keith Cowing on June 18, 2008 6:48 PM. "The Government Accountability Office (GAO) today sustained the Boeing Company's protest of the Department of the Air Force's award of a contract to Northrop Grumman Systems Corporation for KC-X aerial refueling tankers. Boeing challenged the Air Force's technical and cost evaluations, conduct of discussions, and source selection decision." By Keith Cowing on June 18, 2008 5:53 PM. "Odyssey Moon, a commercial lunar enterprise, announced today that former NASA Associate Administrator Dr. Alan Stern has accepted a role with the Isle of Man-based company. Dr. Stern was a recognized engine of change and innovation as chief of NASA's Science Mission Directorate, championing new science programs while being a stalwart advocate of cost and value control when he served at NASA." By Keith Cowing on June 11, 2008 11:45 AM. "Space Adventures, the only company that provides human space missions to the world marketplace, announced today that it has finalized an arrangement with its long-standing partner, the Federal Space Agency of the Russian Federation (FSA), to launch the first private mission to the International Space Station (ISS). The mission is scheduled to launch in the second half of 2011. This private spaceflight opportunity will be a fully dedicated mission of the Soyuz-TMA spacecraft with two seats available for private space explorers, along with a comprehensive package of mission services including science, education and media program options." By Keith Cowing on June 4, 2008 2:21 PM. "NASA and Google Inc. Wednesday announced plans to develop a new high-technology campus at NASA Ames Research Center in Mountain View, Calif. Under the terms of the 40-year agreement, Google will lease 42.2 acres of unimproved land in NASA Research Park at Ames to construct up to 1.2 million square feet of offices and research and development (R&D) facilities in a campus-style setting. Today's announcement is the latest in a series of collaborations dating back to September 2005, when NASA and Google announced plans to work together on a variety of technology-focused R&D activities. NASA and Google signed a memorandum of understanding that year, launching negotiations for this development in NASA Research Park. Located at Ames, NASA Research Park is a world-class, shared-use educational and research-and-development campus." This page is an archive of entries in the Commercialization category from June 2008. Commercialization: May 2008 is the previous archive. Commercialization: July 2008 is the next archive.